Bus drivers and other workers for First Leeds are to stage an indefinite strike in a worsening row over pay. Unite said 1,000 of its members would walk out from 02:00 BST next Tuesday. The union accused First of taking an "extremely aggressive" stance by sacking a branch secretary and two other workers for "legitimate trade union activity". 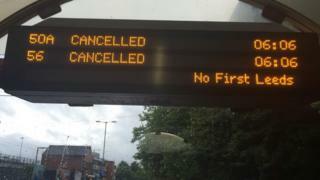 First Leeds said the "unjustified action" would affect tens of thousands of people across the city. Drivers have already held two 24-hour strikes, with Unite claiming they earn £2 less an hour than other First drivers in the region. The firm dismissed this as "nonsense" and said the union had failed to back up "this ridiculous suggestion". First Leeds also disputed the "aggressive" stance alleged by Unite and said it was investigating some very serious allegations. No members of staff have been disciplined for taking part in industrial action or for any legitimate trade union activity, it said. First Leeds offered a 38p per hour rise frozen until May 2018, which Unite described as "insulting". Unite regional officer Phil Bown said: "The management needs to stop ducking and diving and commit to holding genuine and meaningful talks, otherwise this strike could go on for some time with an adverse impact for bus users in Leeds - something we have desperately sought to avoid." Paul Matthews, managing director of First Leeds, said: "I'm very disappointed and deeply frustrated that Unite plan to cause such huge disruption for our customers in Leeds. "This is not a last resort as Unite claim - not only do we have a planned meeting before Tuesday to try and resolve the dispute, but Unite have repeatedly refused to let all staff vote on our above inflation offers." The bus provider plans to provide a reduced service in Leeds, with buses in Bradford, Huddersfield and Halifax all unaffected.